Before going to BritMums, I had a bit of a clothing dilemma. I had a wardrobe full of stuff, but nothing to wear. Well, nothing that made me feel 1000% confident and I think that is something that you must feel when you go to a blogging event with 500 other women. I know we all don’t really care what everyone else is wearing, we are just excited about meeting the people we’ve been chatting to for months or years, but in the end, we do care about what we wear, because let’s be honest, we all worry about how people perceive us and if we meet someone for the very first time, we want to make a good impression on them. Wearing plus sizes doesn’t make the search for the perfect outfit any easier, because let’s be honest: There is not much choice for plus size clothing on the high street, so whenever I am after a nice outfit I will ultimately switch my laptop on and start browsing the internet. 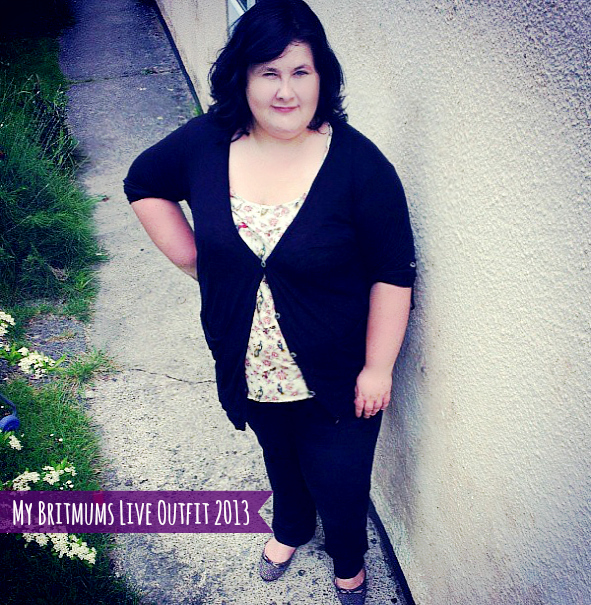 There are a number of website that offer a great choice of women’s clothing up to a size 32, but Simply Be is by far my favourite online retailer. The clothes are well-made, modern and most of all, they don’t make you look like you are wearing a circus tent. I love that Simply Be work with every day people when coming up with their designs, most recently with three fashion bloggers who designed their own dresses, so when BritMums Live got closer, I started having a look for possible outfits. I ordered a gorgeous dress from the website a while ago, but for BritMums Live I wanted to be a little more covered up around my bottom half. So in the end, I ordered two pairs of jeans – one in classic black and one in bright blue – really brave colour choice when you are me! On day one, I paired the black jeans with a bird-print top that I had ordered from Simply Be a couple of weeks before BritMums Live and a light 3/4 sleeve cardigan to cover up those bingo wings. On day two, I was brave and wore my bright blue jeans, which received quite a few compliments, and teamed them with a black and white top which I picked up in Germany about a year ago. Both days I wore studded flats that Ben had picked up for me as a surprise. Good man buying his girlfriend a new pair of shoes! Anyway, I felt super comfortable in the clothes I had ordered and have actually worn my bright blue jeans quite a few times now. They have a great fit and they make me feel good and that’s what clothes should do, if you are a size zero, 12 or 26. Disclosure: This post was brought to you by Simple Be, but you can ask my wardrobe and my bank account. I am a massive (no pun intended) Simply Be fan!